I realised that a while ago I said I'd start doing a monthy 'beauty favourites' post. I haven't really stuck to it - and by 'really', I mean I did it once. Soz. The truth is, I don't change beauty products that often any more and I really do think that's because, after years of trying and testing, I've found some really good products that I just can't beat. I'm also much more into fashion than beauty at the moment - I've explained before that I'm always on one or the other, I've just been on clothes for quite a while now! Anyway, I thought I'd do a post today to show you what some of these much-more-than-just-a-monthly-favourite products are. These are products that I purchase again and again, and plan to do so until I die/they get discontinued. 1. Superdrug Vitamin E Gentle Micellar Solution - I've tried many a micellar water (what a great sentence), but this is by far the best on the market. It's gentle on the skin, doesn't dry it out and, somehow, it manages to remove all my make-up in two big cotton pads. For reference, I wear Estee Lauder Double Wear (basically cement), so that's a big achievement. My skin is really sensitive, and this formula keeps it clear, super soft and balanced. Read my full review of the Vitamin E range here. 2. 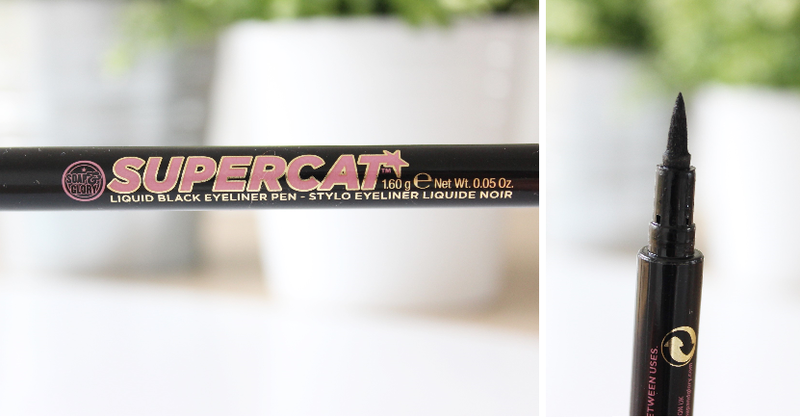 Soap & Glory Supercat Liquid Liner Pen - I struggle with every aspect of eye liner, but I love it so much that I voluntarily embark on the struggle every morning. This liner pen makes things a whole lot easier than they used to be. It's the perfect eyeliner for people with shaky hands, as it's a stiff pen that you have full control over. Importantly though, it has a real fine tip so you can still create a natural flick at the side. It stays on all day, and it's super black. It's everything I've ever wanted in a liner and more - if you haven't yet, you need to try this! 3. TRESemme Heat Defence Spray - You're probably thinking, a heat defence spray? Surely that's nothing special. But it is - because it's much more than that. This spray transforms my hair from dry and frizzy, to super soft and 'manageable' (as much as I hate that overused cliche hair word!). For me, this is like my spray-in conditioner as well as my heat protectant. I use it before I dry, and before I straighten and I'd be lost without it. What are your all time favourite products? p.s just one week left to enter my giveaway! 8 comments on "My All-time Beauty Favourites." I LOVE the vitamin E range from superdrug! Such good quality. ooh i want to try micellar water so will definitely be trying this one! This was such a great post - and I am quite the same I don#t change beauty products all that often either as I stick to what works. But I definitely want to check out this eyeliner now as I am in the market for a new one since my favorite one changed formulas. Make-up can bring a little ray of light into my life. Most of the makeup removal products are available. Heavy make-up such as face paint is oil based therefore it resists the traditional washing up mechanisms of soap and water. Oil is even immune to most make-up removers as they are soap based.